Don Draper might have a highly questionable past, but his talents in advertising is doubtless. This dashing man is a force to be reckoned with when it comes to creating advertising campaigns for his clients. Don Draper keeps his look classically simple and timeless. He prefers wearing well-fitting suits, a white dress shirt underneath, and a pair of black Oxfords. He is also known for his love for cigars and whiskey. 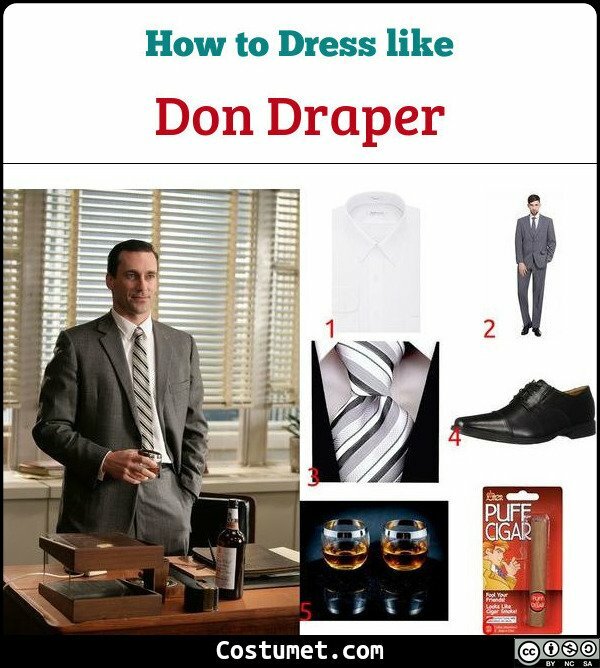 Here’s everything you need to look like Don Draper. 1 White Dress Shirt A white dress shirt underneath a suit allows for a clean and classic look. 2 Grey 2-Piece Business Suit A 2-piece suit is a timeless choice for business attire. 3 Striped Tie Don Draper prefers a striped tie over a bow. 4 Black Oxfords A pair of black Oxfords make for a classic look. 5 Whiskey Glass Don Draper loves a glass of whiskey after a hard day. 6 Fake Cigar Bring along a fake cigar as you pose as Don Draper. Don Draper was portrayed by Jon Hamm from 2007 to 2015. Dress like Dustin Henderson with trucker hat, graphic tee, windbreaker jacket, corduroy pants, athletic shoes, & optional walkie talkie. Dress like Lucas Sinclair with camouflage bandana, button down jacket, sneakers, backpack, blue jeans, & optional walkie talkie.